In golf there are few experiences more palatable than the post-round respite — be it while enjoying a score-boasting libation, or even better, a sit-down meal that celebrates an indelible day on the links. Ak-Chin Southern Dunes: In addition to a Lee Schmidt/Brian Curley/Fred Couples-designed pure golf experience that earns Golf Magazine’s 82nd best public course in America, this south Phoenix facility is known for one particularly tempting combo: the Arroyo Grille’s smoked jumbo chicken wings tossed in sweet chile sauce, coupled with a secret-recipe milkshake that was once an addictive mainstay at the PGA Tour’s former The International at Castle Pines, Colorado. Grayhawk Golf Club: This superbly polished daily fee in north Scottsdale gets enthusiastic high-fives for much more than a top-ranked learning center and 36 holes of Tom Fazio and Gary Panks/David Graham golf. 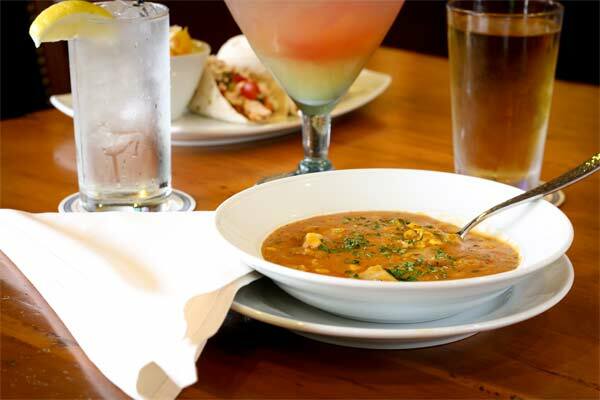 At Phil’s Grill, named for Grayhawk’s longtime PGA Tour ambassador Phil Mickelson, the Navajo corn chowder is a roll-your-eyes-back experience — especially when paired with the blackened chicken soft-shell tacos. 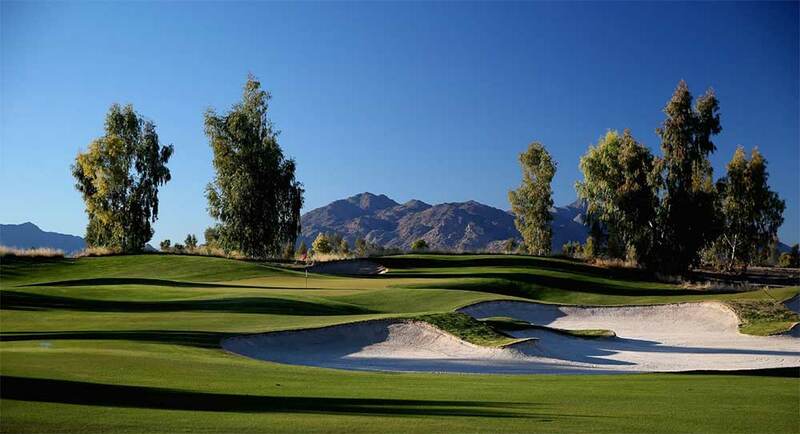 Boulders Resort & Spa: Thirty-six holes of incomparable, semi-private Jay Morrish golf is reason enough to play this perennial five-star property in north Scottsdale. 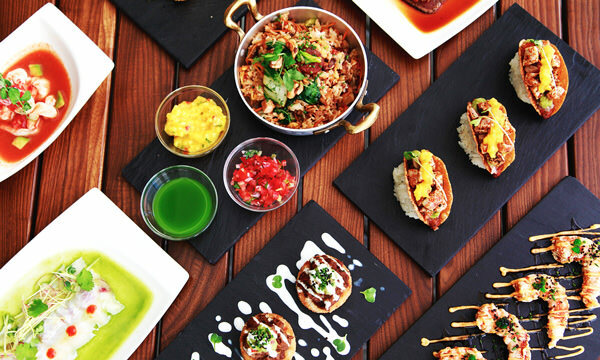 But then throw in a just-completed year-long renovation to the golf club’s Grill Kitchen & Bar, where the must-share order is a smoked chicken Divot Nachos starter followed by a tastebud-exploding slice of hickory smoked prime rib — all profoundly orchestrated on a newly expanded, Sonoran Desert-surrounded outdoor patio. 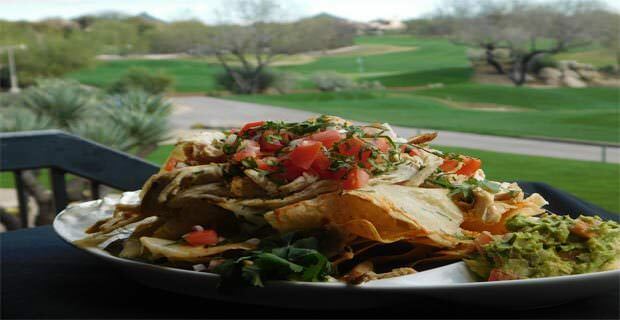 Divot Nachos at Boulders Resort & Spa. The Phoenician: Winner of the Forbes Four Star Award for 15 consecutive years, this premier Camelback Mountain property is splendidly enhanced by 27 holes of Ted Robinson-and Homer Flint-designed golf and further complemented by the golf club’s super comfy Relish Burger Bistro. 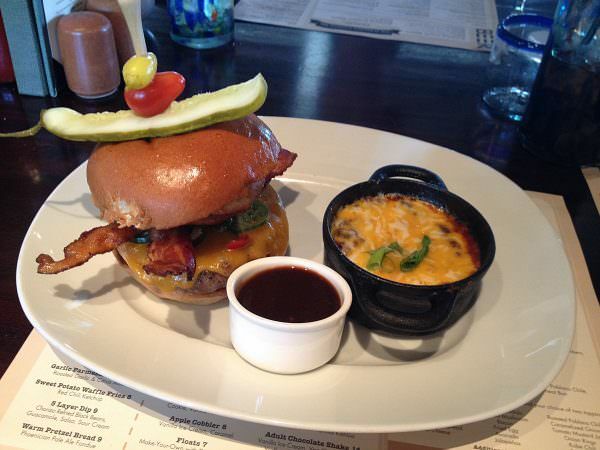 The signature favorite is the Cowboy Burger, a hunger-busting combination of grilled Kobe beef, bacon, onion rings and pickled jalapeños, all sumptuously stacked within a perfectly toasted brioche bun. TPC Scottsdale: Tackling 36 holes of Tom Weiskopf and Jay Morrish golf where the PGA Tour annual stages the Waste Management Phoenix Open provides significant gotta-play-it aspiration. Just don’t miss noshing at the club’s Toro Latin Restaurant & Rum Bar — an acclaimed amenity managed by the adjacent Fairmont Scottsdale Princess — where celebrity chef Richard Sandoval dishes up a “suviche” (sushi and ceviche) styled Angry Tuna Roll that pairs beautifully with a snifter of Diplomatico Reserva rum. 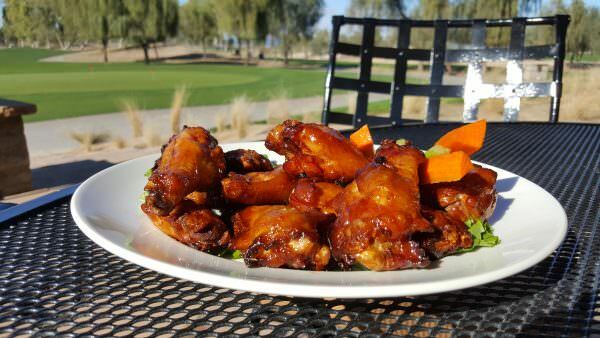 What are your favorite metro Phoenix golf course meal recommendations? Share your comments below! Chris Duthie is a Durango-based contributor. Colorado AvidGolfer is the state’s leading resource for golf and the lifestyle that surrounds it, publishing eight issues annually and proudly delivering daily content via coloradoavidgolfer.com. Follow us on Twitter, Facebook and Instagram.